Box of Frogs improv group were on stage at The Glee Club in Birmingham on Sunday. I could tell you all about just how funny the game of Asthmatic Sirens was and how very clever their production of Winnie the Pooh and the Bank Robbery was but, these things will never be seen again, and that’s the joy of improv. Every show is unique. With eight improvisation comedy actors on stage hilarity is guaranteed. I enjoyed the entire show, it was all very funny but obviously I do have a favourite moment. It involved a couple on their first date, they were using cards which the audience had written little online dating profiles on as their cue cards and the waiter looking after their table, was a depressed ex stripper. It was much funnier than I can make it sound and I was in tears. With heaps of audience participation, as one would expect from an improv comedy group, the audience gave film titles and characters for Box of Frogs to work with and not once did they disappoint. If you know the once British (now American) tv show Who’s Line is it Anyway, it was very much in the same style. We had a few good songs, including the Fiancé Blues and an opera with English translation, some sketches, a three head expert, a two headed psychiatrist, human puppets, an agony aunt bar tender and a questionable supermarket queue! The improv team were Jon Trevor (MC), Geddes Cureton (Keyboard), Karen Benjamin, Grant Orban, Lee Dempsey, Nick Hollingsworth, Suzie Evans, Rich Fallon and Jen Kenny. Geddes on keyboard was amazing. (Think silent movies and the organist in the movie theatres of old) I think it was Jen who stood out for me, but they were all great. Jon was a grand MC. Before the show we enjoyed a drink in the downstairs bar where I discovered the logo for Box of Frogs is exactly the same as my tattoo! (Three wise Frogs) The Glee is Birmingham’s favourite comedy club and hosts some fabulous artists, Box of Frogs played in the smaller theatre, which does have a bar and there was an short interval. The bar does not serve drinks during the performance. Last nights two hour performance ended at 9pm, so an early enough finish for a school night for everyone, the audience is 16+ for this show. Box of Frogs are wickedly funny and I really was in stitches at times. At a full two hours this show was terrific fun as well as being great value for money. Box of Frogs return to The Glee on 2nd September and 11 November. I am planning a return visit. Tickets for Box of Frogs are a very affordable too, being £8.50 including booking fee. Those who remember ground-breaking TV series, Whose Line Is It Anyway? will know what to expect at an evening like this: a succession of games and set-ups that allow the actors to flex their improvisational skills. And so, the format is pretty familiar, but it is the content that remains unexpected. Our host is the amiable Jon Trevor, who sketches in the ‘rules’ for each sketch before selecting which improvisers will play. With plenty of input from the audience (occupations, objects, delusions…) the team members are firing on all cylinders to keep the laughs coming. The hit rate is pretty high and there’s a certain tension in the air, that things won’t work – and, on the rare occasions when they don’t quite come off, are usually as funny as the moments that do, thanks to the wit and easy-going nature of the troupe and especially the host. What the group does best are the musical games. There is something extra magical about pulling tunes and lyrics out of the ether. A scene involving Jen as a barmaid, dispensing advice along with the drinks, is a scream, as three other improvisers approach with problems gleaned from the audience. Likewise, an improvised opera in gobbledegook and simultaneously translated, miraculously appears from nowhere. A blues number is a scream. Best of all is the ‘charity single’ that closes the show – on this occasion it’s an appeal for Viagra for lovelorn lepidopterists, demonstrating how in tune with each other each frog in the box truly is. It features a rap sequence by team member Rich that is dazzling in its wit and relevance. Karen, Grant, Lee, Nick, Jen, Suzy, Rich and Jon, I salute you all – and a very special mention to keyboard wizard Geddes. The brilliant and bouncy Box of Frogs is definitely a group to see at least once before you croak. 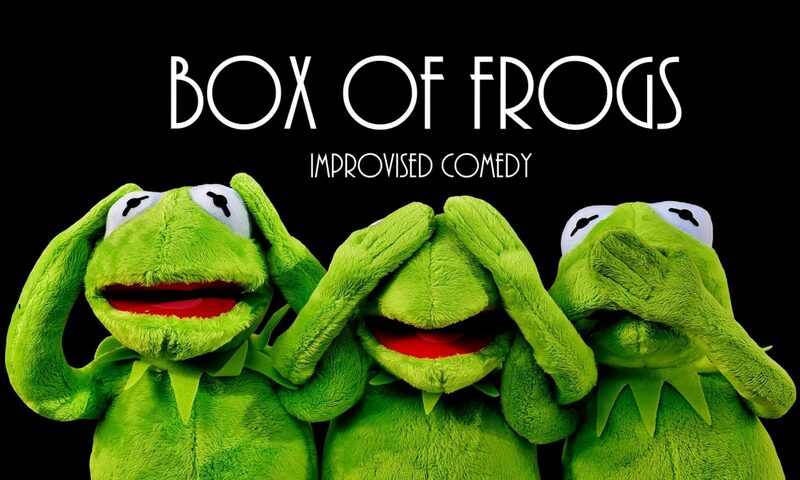 Improvised comedy group Box of Frogs warmly invite you to be part of their crazy, mischievous little family for one night. There is nothing that can prepare you for the evening ahead, even the members of the group have no idea what is going to happen after the audience is settled in. But the one thing that can be guaranteed is you’ll be laughing throughout. Sit back as a whole host of games are played out in front of you, the best part being the performers are at your mercy. You, the audience, get to decide what type of action is about to unfold on stage. Skilled in their craft, the performers are a joy to watch both for their comedic talent but also the anticipation you feel as a new game is about to start. The only thing that is carried through is the occasional nod to a hilarious moment in a previous game, other than that, expect every game to be uniquely different, as the imagination of the improvisers is boundless. The divide between audience and performers melts away and you are welcomed as part of this dysfunctional comedic family, breathing fresh air on the normal constraints of traditional theatre. With no shushing from other audience members, and even occasional shouting permitted in some games, it is almost like letting your hair down – well not quite but you get the gist. It is good fun and a delightful comedy night. Regardless of whether you are a seasoned improv comedy goer, or a newbie, a night filled with unexpected audience suggestions teamed with unpredictable interpretations from the performers, no two nights are the same, so give it a try. It will definitely be something you have not seen before. Box of Frogs got the audience involved from the get go by asking us to shout out random words to questions. No one was forced to join in if they didn’t want to. They improvised lots of different scenes including one with talking penguins that had me in stitches. At the end the audience were asked for a suggestion to start and end a story. They took my end suggestion which was “and they all died in a fire”. My standard comedy heckle. Compared to a usual comedy night this was riskier as due to the nature of improv it’s all unscripted so they can’t test the jokes out on their friends. This meant that some bits were a bit strange but overall i was so impressed at how fast these comedians brains worked. The other thing that was lovely to see was the reactions of the other comedians that were not involved in the game, they were in stitches and seemed like a great group of people. You can join in by shouting out or writing down suggestions but you don’t ever get picked on. I went on my own and had no problems. Overall I had a really good night and lots of laughs. Give it a go if you like comedy. Box of Frogs engaged with the audience so well that they were laughing before any of the sketches began. They outlined the rules for each sketch – for example, we have an expert being interviewed – and then asked the audience to add in the details. In this performance the audience suggested an expert in cabbages, and the interview revealed just how envious cabbages are of sprouts at Christmas. The great thing with any sketch show is variety, and there was a huge amount on offer in this show. Wordplay, ridiculous situations, poetry, physical comedy, singing, unusual accents, comments on gender equality and silly dancing were all used to entertain a packed house. This means there really is something for every audience member, and it would be a challenge to not laugh at some point in the two hour show.